Hailstones, by Lidia Rozmus (Evanston, Ill.: Deep North Press, 2006), 7x 9.5. Boxed, limited edition. ISBN: 1-929116-15-2. $50.00 postpaid from the author at 1 Echo Ct #11, Vernon Hills IL 60061-3003. With the publication of Hailstones, Lidia Rozmus is back like a comet blazing into a night of stars. Santôka is her focus, photography and sumi-e her medium. The genius of her vision is a gift of art unique in haiku collections. Hailstones honors Taneda Santôka, a twentieth century Zen monk and an iconoclastic haiku poet whose poems are spare and honest. By nature keenly sensitive, he apparently suffered from depression, an affliction exacerbated by the circumstances of the first part of his life, which included the suicide of his mother and younger brother, alcoholism, and the breakup of his marriage. Failure and loss led him to the brink of suicide himself in the fourth decade of his life, but through the efforts of the head priest at Hoôn-ji, Santôka entered this Sôtô Zen temple and a year later emerged an ordained Zen monk. Undergirded by the strict discipline of his training, he journeyed through the country of his own heart and mind, walking alone through Japan, begging and composing haiku. The packaging of Hailstones is like a Japanese gift; every detail enhances the content. From rustic simplicity to sophisticated complexity, integrity of purpose exists. Form with Rozmus always follows function, and the effect of image and text, number and texture leads to an artistic cohesiveness that can mesmerize the reader. Not only a master of sumi-e painting, Rozmus is an accomplished photographer, using her camera lens as a kind of radar scoping the feelings generated by landscape, which she then converts to impressionistic images in the darkroom. Her refined sense of design is clear throughout Hailstones where she uses all her talents to maximum effect. Let’s take a look at the collection. Affixed to the top of an ordinary cardboard box is a black and white photographic image of a powerful thunderhead framed in black. The title and names of the people who contributed to the work appear in white print. The reader understands that this is a multicultural effort addressing a Polish and Japanese audience, as well as one that speaks and reads English. Opening the box, the reader will find a simple sheet of white paper folded in half with the contributors’ credits. Among them are John Stevens, himself a Sôtô Zen priest whose translations of Santôka’s poetry (from his Mountain Tasting, 1980) are used here; Masanobu Hoshikawa, calligrapher; Kay Kawaguchi, translator from English to Japanese; Nanae Tamura, translator from Japanese to English; Wioletta Laskowska, translator from Japanese to Polish; Mamoru Murakami, writer and literary critic, who penned the introduction; and Charles Trumbull, who wrote the foreword. The contents of the package are enfolded in rice paper, saturated with an original sumi-e painting, echoing the intensity of the thunderhead of the black and white photograph on the outside of the simple box. The fragile paper is sealed with Rozmus’s square white embossed signature stamp. As with a wax seal, it must be broken to find out what is inside. Here lies the treasure: thirty-six folded panels of heavy-stock paper: the first three introduce the contents of the work to follow, each addressing its particular audience. These panels include a foreword; a background of Santôka’s haiku; Rozmus’s raison d’être for producing this work on Santôka; a list of acknowledgments; the background of contributors; and a chronology of Santôka’s life. 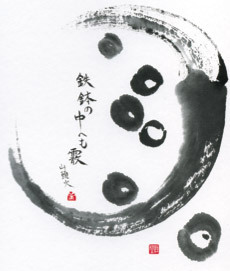 The final thirty-three panels showcase Santôka’s haiku and the artwork the poems inspired, strong and spontaneous brush movements of the sumi-e painter and calligrapher, beautiful enough to be individually matted and framed. Considering the talent and originality gathered together in Hailstones, this is a rare collection for those who appreciate nuance and beauty, a fitting tribute to the power of Santôka’s haiku and its profound effect on his readers. Lidia Rozmus says about the man, “With every step he is human, a buddha with every breath.” With her photographic eye and sumi-e brush, one might have similar feelings about Rozmus.